A screen displays the logo of the open-source web browser Firefox. 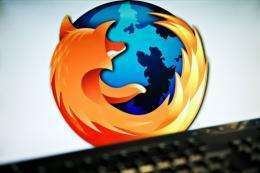 A fast, sleek new version of Firefox was released on Wednesday to vie Microsoft's Internet Explorer 9 (IE9) and Google Chrome in the fiercely competitive market for Web browsing software. A fast, sleek new version of Firefox was released on Wednesday to vie Microsoft's Internet Explorer 9 (IE9) and Google Chrome in the fiercely competitive market for Web browsing software. Nonprofit group Mozilla made Firefox 4 available as a free download to computers powered by Windows, Mac OS X or Linux operating systems in more than 80 languages. Firefox 4 was billed as six times faster than its predecessor and boasted features including a "Do Not Track" signal to opt-out of having online activities recorded by websites for targeted online ads or services. The open-source Web browsing software was also designed as a stage for rich video or game graphics based on the HTML5 standard being touted as a boon for online visual experiences. "Firefox puts users in control of their Web experience, providing a streamlined user interface, fun new features, a boost in speed and support for modern Web technologies," Mozilla said in an online message. Powerful new versions of Chrome and IE9 Web browsers were released earlier this month by Google and Microsoft, respectively, putting pressure on California based Mozilla to release a finished version of Firefox 4. Microsoft's Internet Explorer is the most widely used Web browser in the United States followed by Firefox, Chrome and Apple's Safari. Last Wednesday? Because the 22nd of March is a Tuesday. They're using the past tense to talk about the future. Obviously this article was written by time travelers. I've never quite understood that. Does the AFP write that in a time zone ahead of us, then the article get date stamped with whatever date the physorg servers have? That's the only way it would make sense to me. (Well that, or the time traveler thing Sleepy). Sigh, get over it, Chrome won, it's over. Move on. The problem is not between Firefox and Chrome but between them and microsoft IE9. Anything that helps push back microsoft is helpful. So yes, I like chrome and I use it but I also use firefox as often as I can and will not give up. The last thing we want is to go back to the situation where microsoft had a monopoly on browsers and kept refusing to introduce the slightest improvement in every field. So know the enemy and it aint firefox. Honestly the only reason that MS had a huge portion of market share was because IE to this day comes standard with any MS OS. There was never a monopoly in this area... it was argued that there were unfair marketing practices ( giving it away for free to compete with browsers you had to pay for ), the new model is that all competative browsers are free -- this was not the case in the 90's. Firefox was a huge step in theright direction, and chrome is an even bigger step -- but lets not foget that the latest analysis states that Win 7 + IE - Flash is the safest combination for internet browsing our there. The issue now is that there are a lot of great ideas for browser addon that might never get the attention they diserve unless a friend tells you about them or you realise you are lacking a feature that comes standard on IE, such as saving all open tabs, you have to download an add on for chrome to have this feature at least when I first downloaded chrome. My biggest beef with FF is that a lot of the add ons I use break once there is an update -- this has been my biggest excuse not to upgrade until most of my add ons have compatibility. Lets face it - its not just about the browser to some of us, its about what the browser allows us to do, and that is not just browsing web pages for your more sophisicated users. As a web developer I am loving the new firefox, it runs my web apps even faster then Chrome (and Chrome does it very fast). Good work Mozilla! "Win 7 + IE - Flash is the safest combination"
"Lets face it - its not just about the browser to some of us, its about what the browser allows us to do,"
Where did you get this stat? Pwn2Own does not allow linux variants in the competition anymore because they've not been able to break in. I would say that Linux + FF + NoScript would be safer by leaps and bounds to whatever Winanything + anybrowser can offer. Sorry, but this is BS. Microsoft went to extraordinary lengths to shoehorn in their browser and interfaces into the OS so as to make it near impossible to disentangle the browser from the OS. This meant that the browser had to ship by default. No, that's not anti-competitive. I like FF even if since 2 kernel versions, it has some odd behavior. But still, it's the only browser that can open more than 50 tabs and then to close and then to reopen them again. I use only FF for more than 2 years and I don't see any decrease in functionality, if we don't count Facebook picture upload. Can't wait to upgrade to FF 4.0.
it's the only browser that can open more than 50 tabs and then to close and then to reopen them again. Which I do confirm. Just now having 113 tabs open. Not to mention that firefox is the only browser working with my OS. And anyway, since KDE 4.6 I have some problems with RAM which I thought are FF related, but now I think there's some bug in KDE or kernel and I limit myself to around 50 tabs. But before that, I had more than 100 tabs and FF was working like a charm. Lol I understand that feeling but out of PURE curiousness what os?? Warp? Amiga? eComStation - the official Warp successor. See ecomstation.com . OS/2 evolved into eComStation after IBM scrapped it. Shame really, although I never got a chance to play around with it, it's supposedly very stable and secure. please read entire articles and the comments submitted by people many make good points for and against.